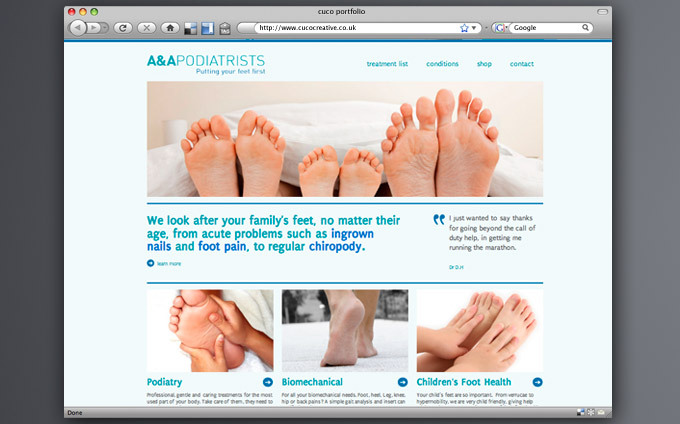 We have just pushed the button on a new site for A&A Podiatrists. CuCo designed and developed the site using the popular CMS WordPress. It is built around many of the core features of WordPress and relies heavily on custom fields and custom posts to create a very simple to administer site. The client wanted a CMS that was really simple to use and which didn’t have a steep learning curve. The site was given to the client completely empty and within a week they had populated it themselves – with CuCo at the other end of the phone with any help they needed and to guide them through.